When is the best time to visit Redang? Come in July/August/September? Isn't that the Monsoon season? How is the weather in Redang? Is it raining? Big waves? What is the prerequisite to learning Diving? We are not going to Marine Park, why must we pay RM5/person? We would like to cancel our booking. Can we obtain a refund? We are not going on the Snorkelling Trips, can we get a refund? Do we need to print out any Voucher and provide to the people at the Jetty? Can we get the Person's contact number, the person who will pick us up from the Bus Station or Airport? Can we go on a Fishing trip around Redang? Can we go Island Hopping around Redang? From our 20 over years of operating as Resort Operator, our busiest months are from April till July, as there are many public holidays and school holidays for both Malaysia and Singapore. If you like the crowd then visit during these period. However from our experience, the sea is most calm in the months of September and October and Redang is generally quiet, making it the perfect time for couples or family who prefer the peace and quite. The Southwest Monsoon starts from June till September while the Northeast Monsoon is from November to February. Here at Pulau Redang we are only affected by the Northeast Monsoon. Generally the weather is beautiful from April till October. Normally the monsoon only hits Redang from Dec till February with heavy rain and waves. Sometimes the tail of the Monsoon affects our season in March. Generally the weather in Redang is Nice and Sunny from April till October. In March, the weather is a little mixed, sometimes affected by the tail of the Monsoon, sometimes not. Please note that, in general there would be a few days in each month where there will be rain, or big waves. We are not able to predict the weather in Redang, let alone days, weeks or months ahead. You should be able to Swim, be comfortable in water, with no fear of putting your head down in the water. Click here for full explaination. The Pulau Redang Archipelago consists of 9 islands including Pulau Redang, Pulau Pinang, Pulau Ling, Pulau Ekor Tebu, Pulau Kerengga Besar, Pulau Kerengga Kecil,Pulau Paku Besar, Pulau Paku Kecil and Pulau Lima. The marine waters surrounding these islands up to two nautical miles from its shores have been designated as the Pulau Redang Marine Parks Malaysia. So, when you visit Pulau Redang, you are actually visiting a Marine Park. Don't be confused with the Marine Park Centre where all guests would normally visit for a snorkelling trip. Also please note that this is collected by the Marine Park officials for the Conservation of the Marine Park. 50% tour fee will be forfeited for cancellation made above 14 days before visit. 100% tour fee will be forfeited for cancellation made 14 days and below before visit. 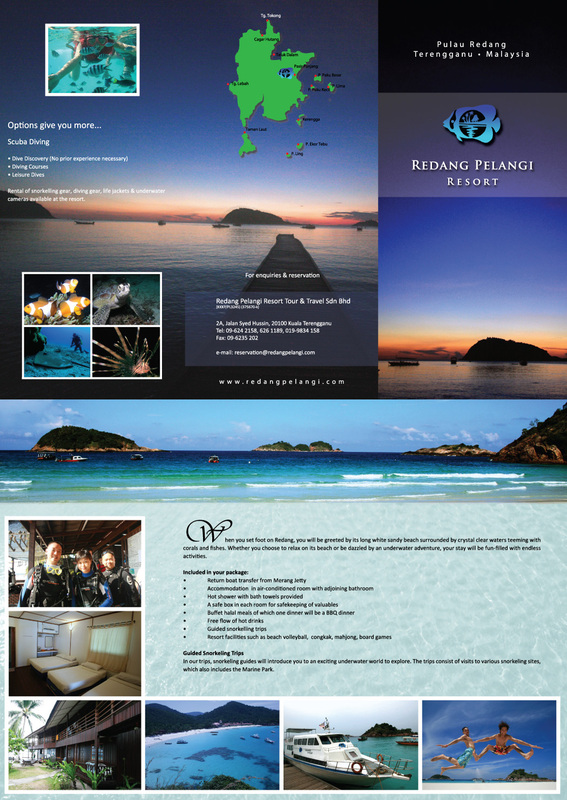 The snorkelling trips are complimentary activities organised by Redang Pelangi Resort. If you wish not to attend these trips, you have the option NOT to rent the snorkelling equipments (Life Jacket, Snorkel & Masks). No you wont need to print any voucher to board our boats at the Jetty. Our staff at the Jetty would have a list of all the groups. Just notify our staff of your arrival and number of people you have. He will confirm the group as well as number of people in your group. If you have a change in the number guests, please notify our staff. Who will pick us up from the Bus Station or Airport, and can we get have the Person's contact number? We would SMS to person's contact details to you one day before your travel. This is because we have a few drivers and won't know who will be allocated to pick you up till a day before travel. As Pulau Redang is a Marine Park, we are NOT allowed to fish within the 2 nautical mile area. However you may fish if you are outside the designated Marine Park zone. In Redang there are only 4 stretch of beaches. The Long Beach is where almost all the resorts are situated with all the beach activity found here. You are able to access Kalong Beach via a quick walk (10 mins from Redang Laguna). Berjaya Beach Resort's beach hosts only Berjaya Resort. And the last beach is the Chagar Hutan (Turtle Bay) which is off limits to guests. Thus since most of the activity is on the Long Beach, there is NO such service on Redang Island, unlike Pulau Perhentian where all the resorts are spread out across the island.